Today we are going to learn about how to create simple user registration, login script with the session. Here I have created a simple users register,login, and logout module coding. For form validation,email validation,session validations i have used CodeIgniter validation libraries functions. Create a new 'user_registration' table using the below code. Flow steps for user registration system. Create a simple register and login HTML form layout. Load HTML page to your main or access controller. 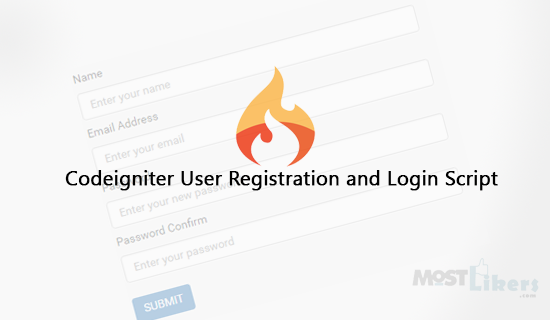 To validating the form use CodeIgniter validation libraries. must you have to check unique email in the database. After register, the user sends a new email to verify they email id. Check your controller whether session values time to exit or not. Create a new controller object name called (users) load the below function to that controller. $this->session->set_userdata('user_session_info', $session_data) - user_session_info it's a session name we are storing user information to that session. $this->session->set_flashdata - it will be store temporary session to that page. $this->form_validation->set_rules - Validation rules either form value true or false checking conditions. <input type="password" name="new_password" value="<?php echo set_value('new_password'); ?>"